Directions: Grab your paper and pencil. Write a solution to the following problems. Be sure to show your work to support your answer. Use your graphing calculator for checking only. Consider the equation y = x2 - x - 6. Answer the following questions, stating how you arrived at your answer. a) Determine whether the parabola opens upward or downward. c) Find the x-intercepts, if any. d) Find the equation of the axis of symmetry. 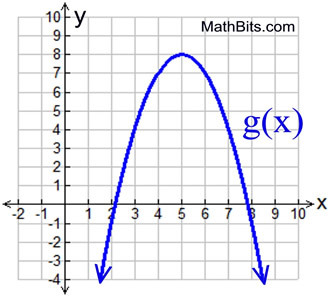 Given a quadratic function, which of the following choices explains the meaning of the zeros graphically. When factored, f (x) = (x - p)(x - q) where p and q correspond to the y-intercepts. When factored, f (x) = (x - p)(x - q) where p and q correspond to the x-intercepts. 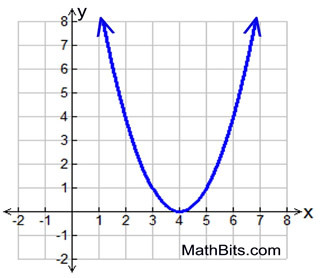 When factored, f (x) = (x - p)(x - q) where p and q correspond to the turning points of the graph. When factored, f (x) = (x - p)(x - q) where p and q correspond to the axis of symmetry. Shown below is the equation for function f (x), and the graph of parabolic function g (x). Which function has the larger maximum? What is the equation of the axis of symmetry for this parabola? 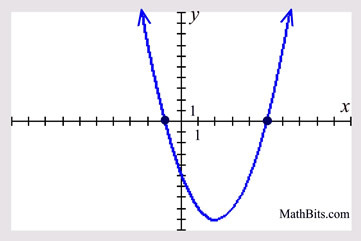 Which of the following statements is NOT true for the parabola seen in the graph? The axis of symmetry is x = 1. The "a" coefficient is positive. 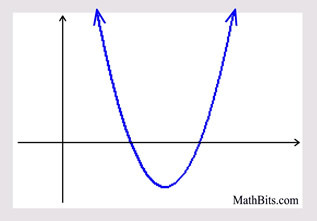 The parabola has two positive roots. Which equation could be the equation of the graphed parabola? 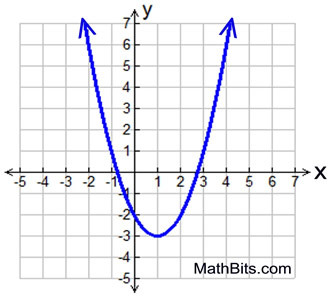 What are the roots of the graphed parabola, assuming the roots to be integers? 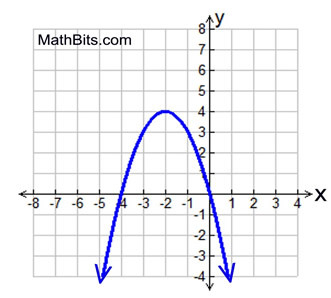 What is the vertex, or turning point, of the parabola y = 4x2 - 6x - 1?